The IsNUllOrEmpty call prevents the execution of the attribute call when NodeId is empty. cloneDoc is a new instance that has the same XML document. Any changes to the cloneDoc does not affect the originalDoc XML document. This error indicates that the user credentials provided on the request are not valid for this realm (localhost). IIS is expecting to get a user that it can find on the local machine or domain. If you provide an existent local or active directory credential, the error will no longer be raised. However, you probably did not want to add Windows accounts for your custom authentication in the first place. In addition, even if you are using a local account, you can notice that the custom validator Validate method is never called. This is expected because IIS has already done the validation. We are changing the security mode to use transport with message credential which expects a message credential type. We set the credential type to UserName. This setting however requires for you to install a certificate on your local IIS and use HTTPS instead of HTTP, so make sure to change the endpoint address in both client and server config files to use HTTPS. For your development environment a Self-Signed certificate will be sufficient. I hope this small article is able to help. Any of the scenarios listed above would generate the error. Let’s take a look at a ServiceContract that can generate this problem. 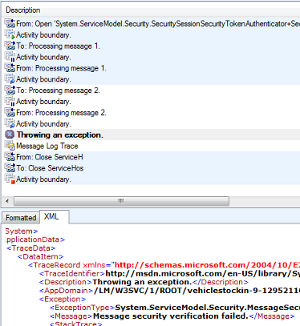 The service contract generates the error because both operations are mixing contract types with primitive types. The Register operation has the operation parameters as primitive types and the return type as a contract type (MixType3). The RegisterComplex operation has a contract type as parameter and a primitive type as return type (MixType2). As you can see, both operations are consistently using either primitive types or contract types for both operation and return parameters. I hope this tip would be useful when designing your next WCF Service operations. If your WCF Library project does not auto start the WCF Service host when trying to start the project in debug mode, the project file has some missing elements. A way to check this is to right click on the project name (Visual Studio) and look for the WCF Options tabs on the left side of the window. If you do not see the tab, this means that the library project for some reason was not created as a WCF library. · Look for your project file which should end with a .csproj extension and open the file with your favorite editor or just notepad. o Save the file and select yes when Visual Studio prompts to reload the project. The changes update the project type from a basic library project to a WCF Service library. You can now do project properties and should see the WCF Options tab. The Start WCF service host option should be checked. You can now run the project in debug mode, and the WCF Service Host should start. I hope this save you some time and thanks for reading.